Metal and wrought iron wall grilles are a simple way to bring a Tuscan ambiance into your space. 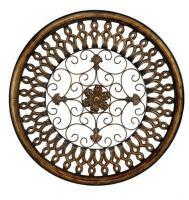 Wall grilles are metal wall decorations that are usually fabricated of wrought iron or bronze. Wall grilles find their origins as a decorative way to cover a vent or to protect an opening such as a window or door. Wall grilles used as a wall decoration, bring a rustic and homey feel to any decor. There are so many shapes and sizes to choose from. They are traditionally square or rectangular, but now round ones can even be found. The styling can be very open with scrolling and other designs or more solid and substantial. 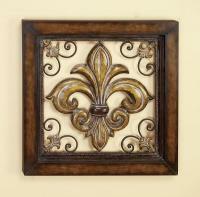 A typical design found in many wall grilles is the fleur-de-lis. Wall grille plaques can combine wood or even mirrors into the design of the metal. An open design will provide an airier feel. This is true even with a larger sized piece, which makes them a great way to fill a large wall without overpowering the space. The color of your wall will show through, bringing it into the design. Wall grilles can be used as decoration both inside and outside your home. There are many designs available that are able to weather the elements outside. A wall grille on the outside wall of your home will add an interesting decorative touch to your patio or a design element to the front of your home. Wall grilles make a great focal point for any space. Use a larger one alone or several smaller ones together to decorate a wall. Consider incorporating a wall grille into your home’s decor to bring a decorative Tuscan accent to any space. Visit www.cheapchicdecor.com to see the large selection of wall grilles available.